Special deals valid for a limited period of time. Fresh 2 room (60 sq m) apartment in a villa. Living room, bedroom, fully equipped kitchen with dishwasher. Bathroom/WC with bathtub and washing machine. WiFi, TV, linen/towels, nice yard and parking included. 10 min with metro to Stockholm City. 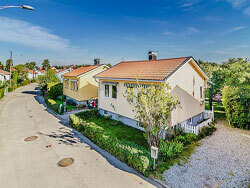 Price: 675 SEK per night.